What comes to mind when you hear “global warming”? 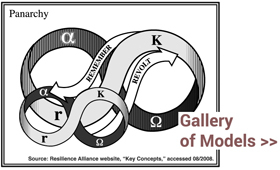 “Representations of sustainability” was a concept I developed for a series of posters displayed at the 2009 opening of the SEA Change Gallery in Portland. This one featuring Barrett Brown’s four universal perspectives is based on his paper, “The Four Worlds of Sustainability” (pdf). Poster design by Andrew Fuller.